Standard in AK, CO, IA, ID, ME, MI, MN, MT, ND, NH, NY, SD, VT, WI and WY when vehicle is equipped with 6.7L Power Stroke diesel engine. 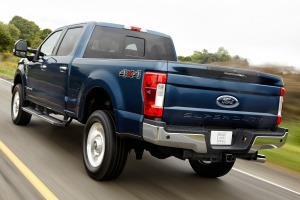 Optional in all other states on vehicles equipped with the 6.7L Power Stroke diesel engine. Hardened engine intake valves and valve seats; Bi-fuel manifold; This package does not include CNG/LPG-fuel tanks, lines, etc. Vehicle will be equipped with the standard factory gasoline fuel system. Additional equipment combined with certified calibration reflash is required, from an external upfitter, to convert the vehicle to a CNG/LPG-fueled vehicle. Ford Motor Company does not provide an exhaust or evaporative emissions certificate with this option when converted to use CNG or LPG-fuel. Ford does not represent that a vehicle converted to use CNG or LPG will comply with all applicable U.S. or Canadian safety standards. It is the responsibility of the final stage manufacturer (body-builder, installer, alterer or subsequent stage manufacturer) to determine that any vehicle converted to use CNG or LPG complies with U.S. Federal, California or Canadian exhaust and evaporative emission requirements, Federal fuel economy standards, U.S. and Canadian safety standards, labeling and any other requirements. 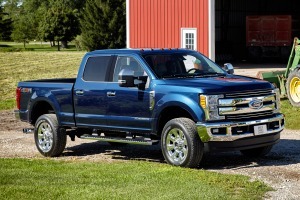 6.7L Power Stroke turbodiesel engine with 440 hp and 860 lb-ft of torque capable of running on B20 biodiesel. Includes engine-exhaust braking which features a manual push-button control on the instrument panel. Heavy service front springs (1 up upgrade above the spring computer selected as a consequence of options chosen. Not included if maximum springs have been computer selected as standard equipment); Note: Recommended only on vehicles which will permanently utilize aftermarket equipment such as heavy-duty winches, brush guards or other apparatus which loads the front axle to the specified Gross Axle Weight Rating (GAWR). May result in deterioration of ride quality. Vehicle ride height will increase with the addition of this package.